“If these buildings could speak…” reads the sign posted directly beyond the arched entry ways of Carr Mill Mall, hinting to visitors that there is history in the rafters, bricks and hardwood tiles of the modern shopping mall. Today, Carr Mill Mall and the adjacent Weaver Street Market are a bustling center of business, culture, art and community. But, if the buildings could talk, they would tell a story of development, hard work and of a town just laying down a foundation. The buildings that are home to many of present-day Carrboro’s major businesses once housed the town’s old cotton mill, the industry that sprung Carrboro into existence. Roland Giduz, a local history buff, said, other than the railroad, the mill was Carrboro’s main industry. Many houses around town, now renovated or taken over by residents and merchants, were at one time living quarters for the mill’s workers. What is now the North Greensboro Street parking lot of Carr Mill Mall was once filled with houses provided by Lloyd and his mill. In 1909, Julian Carr, an Orange County native and Confederate veteran, purchased Lloyd’s mill. He became the major employer of the community, and Carrboro, (called Venable at the time after the then president of the University of North Carolina at Chapel Hill), was named in honor of Carr after he promised to provide electricity to the town. Though those employed by the mill often worked a grueling schedule, life in a mill town helped foster the small-town sense of community that Carrboro is known for. Wilbur Partin, as quoted in “Orange County Trio: Hillsborough, Chapel Hill, and Carrboro, North Carolina histories and tour guides” by Elizabeth Shreve Ryan, wrote that Carrboro was a knit together community of hard workers who never gave up and always helped their neighbors in trouble. After a recession in the 1920s and with demand for textiles in decline, the mill went through a series of owners before opening as Carrboro Woolen Mills in the 1940s. Carrboro Woolen Mills was still a major employer in the town. During this time, 380 of the town’s 1,795 residents were employed by the mill. But Carrboro Woolen Mills was the last name that the old mill would have- at least while it remained a mill. In the late 1960s, the mills stopped operating. The buildings that had created a town were empty. 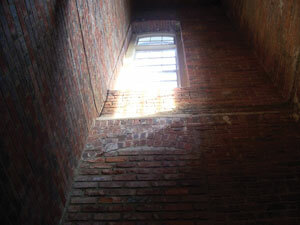 In 1974, the mill was scheduled to be destroyed after a tour showed deterioration of the structure, including sagging floors and unsafe rooftops. Frances Lloyd Shetley, a prominent Carrboro woman, and other members of the community worked to save Thomas Lloyd’s old cotton mill. Margaret Robbins Davis praised Shetley in a November 2005 edition of The Chapel Hill News. She wrote in a letter to the editor that Shetley was a veteran activist who “laid the foundation for today’s renaissance,” and said Shetley nearly single-handedly fought the politicians who tried to tear down the mill. After the work done by Shetley and members of the community, Edward E. Yaggy, Jr. (described by Shetley as “truly a public spirited and far-sighted man”) bought the property and worked on finding another use for the building. 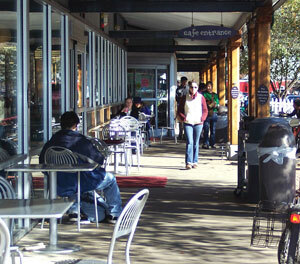 In 1977, Carr Mill Mall opened its doors for the first time – still as an economic force in the town of Carrboro, but this time as a home for various shops and eventually Weaver Street Market. The market, a community-owned grocery store and café, was funded originally by a loan from the Town of Carrboro. Though it is a historical site, Giduz said he does not think the success of businesses now is directly related to the buildings’ history. “It’s quite a community on its own,” he said. As the Carr Mill property changed, so did Carrboro. Harris said Carrboro went from a town of 1,000 people to a town of 18,000 people and from a mill town to a place where people are employed many different places. People that moved to Carrboro from big cities brought an artistic culture with them, and Carrboro is a haven for artists because of its laid-back atmosphere, he said. As the town of Carrboro has undergone a sort of renaissance, the old mill has remained the center of it, physically, economically and culturally. Harris said Weaver Street helps draw people to the businesses in Carr Mill Mall and the 200 other businesses in the downtown area. Carrboro’s businesses today are very contained, and the community has expressed desire that Carrboro stay walkable and condensed, he said.